The main reason for this decision, which effectively killed MacDonald Stephenson’s idea, was that many of the businessmen concerned had a personal interest in protecting their investments in the established shipping companies that enjoyed a monopoly on carriage of passengers and goods into and out of China. As the following states there was considerable debate about which route the Hong Kong to China railway railway should take. The main obstacle and cause of this argument was the Kowloon ridge, around, over or through which the track would have to go. Much preparatory work had already been undertaken when the decision was taken, in 1905, to proceed with construction of the line as far as the border. Nevertheless there was divergent opinion over the alignment of the route. One school of thought, supported by Governor Sir Matthew Nathan, favoured an easterly alignment, despite the fact that its proponent, P.T. Somerville Large, had opted to cross the principal barrier of the Kowloon Hills, at high altitude, through the pass followed by Tai Po Road to the west of Beacon Hill. This section would have required seven tunnels, totaling about a mile in all, together with three viaducts and substantial earthworks. The other option, championed by Director of Public Works W. Chatham, was a more westerly route, which would have entailed a longer journey but less substantial engineering works and therefore lower costs. 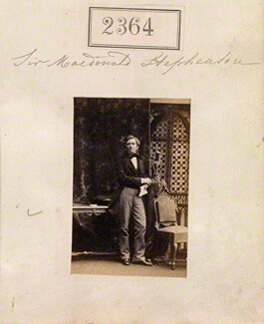 Sir Matthew Nathan was an impatient visionary. A former officer in the Royal Engineers, he had a dream of building a six-lane highway from Kowloon to Calais! Only the broad thoroughfare of Nathan Road, once known as ‘Nathan’s Folly’, survives as testimony to that ambition. The railway became for him something of an obsession. He decided to put an end to the dispute over its alignment by calling for a more thorough survey by an experienced railway engineer. In response to his request, J.C. Bruce arrived in 1905 as Chief Surveying Engineer, with F.W.W. Valpy as his assistant. They worked fast, through the heat of summer, provoking considerable interest among the advocates of both schools of thought. Elsewhere in Hong Kong the entire undertaking was viewed either as a great adventure or an even greater gamble. The preliminary findings of the survey were presented to the Governor as early as September of that year, ahead of the official report published the following month. Sir Matthew must have felt vindicated, for the team had opted for much the same eastern alignment he himself had preferred, albeit with a radically different means of conquering the obstacle posed by the Kowloon hills. Messrs Bruce and Valpy proposed one long tunnel at lower altitude, cutting three miles off the total length of the track and considerably reducing the gradient to 1:100. They found that the western route, besides being considerably longer, would actually have proved more expensive. Construction commenced almost immediately, even before the Colonial Office in London had an opportunity to make its own assessment of the report. Ever-restless Sir Matthew anticipated formal approval and gave the order for laying earthworks between Tai Po Market and Fanling. Lots 618 to 1,140 were acquired with a view to placing the terminus at Tsim Sha Tsui. It was proposed to exchange a portion of the reclaimed ground close to the China Light and Power Company’s premises for the ground known as the Match Factory and compensation would then have had to be paid for the buildings only, It has been possible however to level off a site at the back of the Match Factory on Crown Land and make use of the spoil to make up the approaches to Gascoigne Road, thus avoiding the exchange and adding a valuable piece of land practically free of charge to the Railway. A great deal of earthwork north of Beacon Hill Tunnel has been completed. A certain amount of damage was done by typhoons to the banks between Miles 7 and 12 and one bad slip occurred in Cutting No. 30 at Mile 10-1/2. All damage is now being repaired and the slip has been cleared away and retaining walls are being built to prevent recurrence. At Mile 15-1/2 there is a very wet and troublesome cutting. The contractors, having practically finished the amount of work contracted for, have been relieved of further work and the cutting is being finished on piece work, and is well forward towards completion. It is anticipated that it will be sloped and drained before the heavy rains. The report continues in much the same vein, adding that all tunnels had also been completed, along with bridges, although some of the latter had to be rebuilt owing to “faulty design in foundations in very treacherous ground and to bad material”. It would be hard to tell, from the generally matter-of-fact tone of this document, that Hong Kong had thus embarked on what was by far the most outstanding engineering project it had ever undertaken. Although the total length of the railway would be no more than 22-1/4 miles, it would traverse difficult terrain that required construction of five tunnels, ranging from 150 feet to 7,210 feet, that burrowed under the Kowloon range. Other obligatory features included 48 bridges, 66 culverts and the placement of some 30 million cubic yards of material to create the many cuttings and embankments along the route. 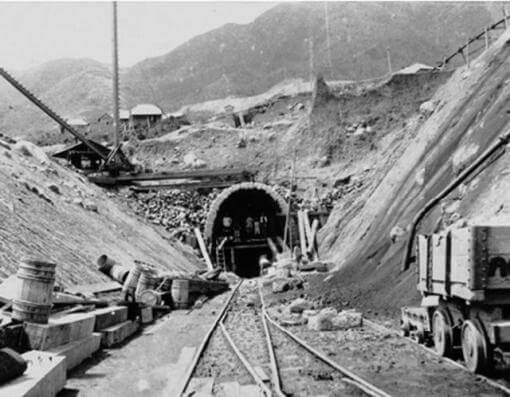 The Beacon Hill Tunnel through the Kowloon escarpment was by far the most arduous, costly and hazardous undertaking, requiring the establishment of construction camps at either side of the range, both to accommodate the considerable workforce and to house the necessary equipment and support facilities. As malaria began to take its toll of construction crews, these facilities were expanded to include improved sanitary and medical facilities. Not until May of 1909 was it possible to celebrate the conjunction of the two headings bored from either side, but by then not only malaria but beriberi had caused several deaths, “some,” according to Railway Medical Officer J.W. Hartley, “with remarkable rapidity”. Until the headings of Beacon Hill Tunnel met, allowing a free current of air through, there was considerable trouble caused by the irritating vapours given off from the gelatine used for blasting purposes. The vapours given off from a well and thoroughly detonated charge do not appear to do much damage, but if for any reason part of the gelatine is lighted and burns slowly before detonation takes place, the fumes given off from the slowly burning part of the charge are exceedingly dangerous, causing stupefaction very quickly, and death is liable to result, owing to fixed chemical compounds being formed in the blood, thus destroying its oxygen-carrying property. On 10 June, a gang of coolies had to come through dense fumes on their way out of the Tunnel at Sha Tin. They all complained of feeling sick and dizzy and three of them died very shortly afterwards; the rest had completely recovered by the following morning. 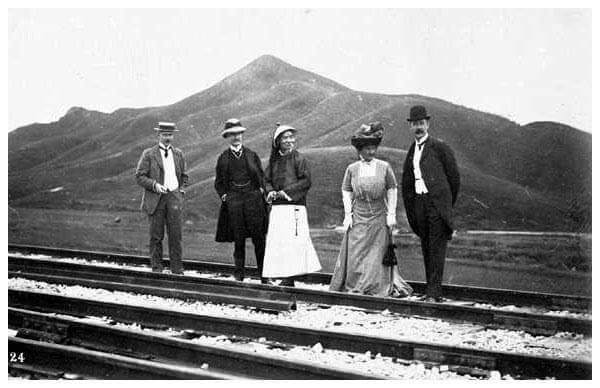 On 1 October 1910 the railway was finally opened for traffic, an occasion marked by a special inaugural ceremony at the southern tip of the Kowloon peninsula, presided over by Sir Henry May, the Officer Administering the Government in the absence of Governor Sir Frederick Lugard. Still lacking was a proper terminus, whose design and precise location remained a matter of debate. To house the ceremony a temporary track was laid in a reserved section of Salisbury Road, and a warehouse belonging to the Hong Kong & Kowloon Wharf and Godown Company was rented to serve as an equally temporary station. The railway was formally opened on Saturday 1st October 1910, as noted above, without a terminus. The event was officially recorded by way of the following notice.